Private events at the conservancy begin with an hour-long interactive presentation of live animals followed by your party in our reception room. You get to choose the animals! Our presentation room comfortably accommodates 25-30 people for your celebration program. The adjoining reception room is a great place to host party games and serve refreshments after the program. We do private events for all kinds of occasions! We do plenty of events for children and adults alike and start the program age ranges at 6 years old. Please see the FAQ list at the bottom of the page for more information on hosting your party with us, and submit an inquiry to get started planning the party! What age range are your programs appropriate for? With the appropriate selection of animals and by adjusting the depth of information, our presenters can tailor programs for first graders to seniors. There are specific instructions on how to touch animals during the hands-on portions of presentations- if not followed, an unsafe situation for both animals and audience members can result. There are moments during every program when we need the audience to be very quiet for the safety and comfort of our animals. Sometimes animals do funny things that cause audiences to react; we need audiences mature enough that we can quiet them down quickly if necessary. Some animals make loud noises or other sounds that are scary to young children. Program length (45 minutes and up) is a challenge for young attention spans. What days and times are available for parties? We try to accommodate your preference, but in general weekday evenings and weekends at 11:30 a.m. or 3:00 p.m. are most likely to be available for these events. How do I reserve the date for my party? After you submit an inquiry and we confirm your animal list with you, payment in full is required to reserve your date. If you cancel more than three weeks before the date of the party, you will receive a full refund. If you cancel within three weeks of the party you will receive a 50% refund. Is the facility easy to find? Yes, we are kitty-corner from the Saline Fairgrounds (a.k.a. the Washtenaw Farm Council Grounds) on the northwest corner of Ann Arbor-Saline Road and Pleasant Lake Road. 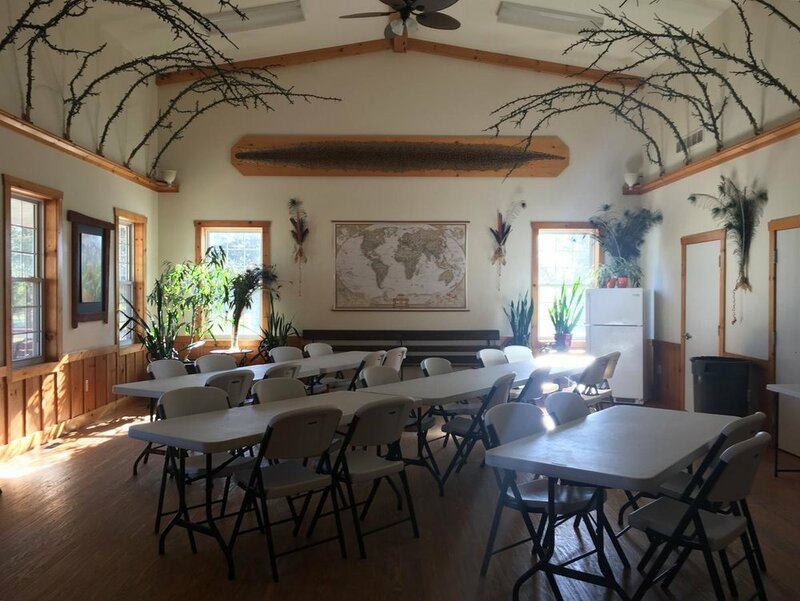 Parties are held in our Education Center, the farmhouse building at the end of the paved parking lot. The address is 4940 Ann Arbor-Saline Road. Can we bring food? The reception room has a refrigerator with freezer to keep your items cool during the presentation. You are welcome to arrive a half hour before your party's start time to decorate, refrigerate your food items, or set up other refreshments. How do I get started? By selecting 6 animals for your presentation! Click Submit Inquiry to give us your details and make some initial choices, and we'll help you plan the big event! What is the reception room like? The reception room is a warm, inviting space that adjoins the presentation room. We'll set up tables and chairs for your group. Can we decorate the room? Yes, you can have access to the room a half-hour before your presentation if you would like to decorate: tablecloths, table decorations, streamers, etc. No wall decorations, balloons, glitter or confetti, please. Can we see the facilities before the day of the program? Yes, please email us or call to arrange a time to stop by and take a brief tour. How long can our party last? Your party may last up to two hours. It will begin with the animal presentation and is followed by your celebration in the reception room. Are there restrooms available? Yes, a men's and a women's room that are both handicap accessible are available for events. Is parking available? Yes, there is ample parking right in front of the building. Is the building handicap accessible? Yes; the presentation rooms are on the ground floor and the sidewalk is ramped from the parking lot to the door. How quickly can I organize my party? We typically schedule programs 6-8 weeks in advance. What is the cost for a party? Fees vary depending on the animals you want included in your program. Your cost is the total of the charges per animal chosen for your party (with a minimum fee of $275). Your total depends on your choice of animals - click Submit Inquiry to see the list. We will call to confirm details. Once final arrangements have been made, payment in full is required to hold your date. Do we get a refund if we have to cancel? If you cancel more than three weeks before the event, you will receive a full refund; after that, you will receive a 50% refund. Canceling week of will not will not allot a refund.